Those of you who didn’t get to see my multi sensory solo show of ceramics at The Bilston Craft Gallery in the Summer have a second chance at New Brewery Arts in Cirencester. 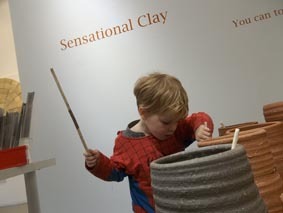 Have just returned from a wonderful opening event where over 200 visitors got to play on my ceramic drum pots, smell the scented sculptures and of course play with some clay. I enjoyed meeting and working with every single one of you! Have a look at some of the photos! Sensational Clay runs untill 29th April. Private views are great for networking and catching up with old acquaintances but near damn useless for taking stock of the exhibits. Although I attended the corporate , viewing of Made in the Middle, I still hadn’t felt like I’d actually ‘seen’ the exhibition. So after workshop duties at St Thomas’s on Tuesday last week I headed down to the MAC to experience the show for real. I was encouraged by a small crowd of visitors around my musical drum pots, gently tapping out rhythms and notes. (I secretly had reservations as to whether punters would interact with the work in a predominantly ‘eyes only’ show) The positive comments on the post-it note evaluation provided more evidence the pieces were being well used. Have a look at the photos on our Facebook page. 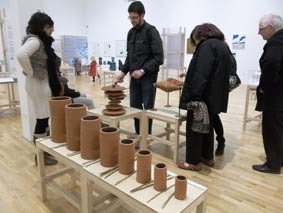 The exhibition runs till the 15 April at MAC then it goes on tour through-out the Midlands.